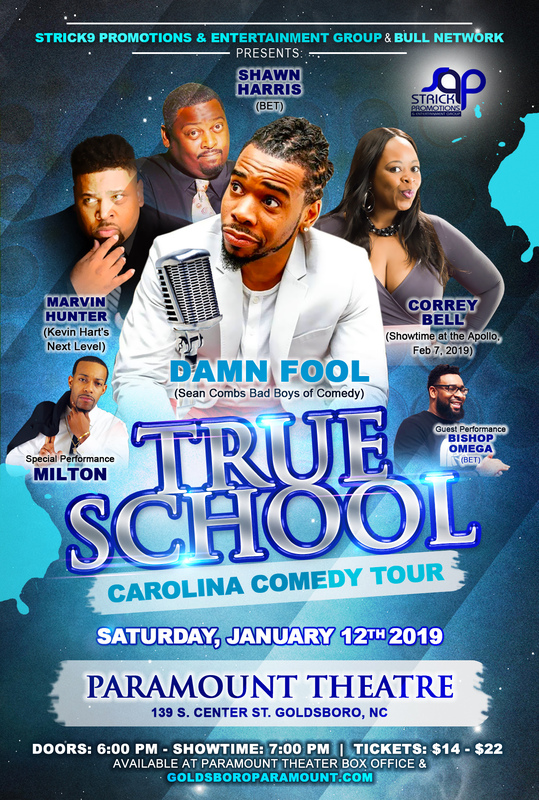 The True School Carolina Comedy Tour is a fast, hilarious, and cutting edge comedy production with some of the newest and hottest comedians in the business. Along with just enough of the classic blend to take the audience to places and times of laughter unexpected, we give you the “True School.” Featuring the talents of South Side Chicago comedians Damn Fool, of Bad Boys of Comedy and more, Correy Bell, appearing on Showtime at the Apollo February 7, 2019 and more, you get the new school. Along with South Carolina native Marvin Hunter, Kevin Hart’s Next Level, and more, complementing Atlanta’s BET Comedian Shawn Harris, a full range of comedic talent will be in the building. The performance will be a night showcasing local talent like Comedian Bishop Omega and the musical talent of local vocal artist “Milton,” as well. Making sure the audience never losses their excitement, DJ I Am Will is going to be delivering the exact musical tones in harmony with both the comedians and the audience, to keep the mood moving in the right direction. This will be a variety show, wrapped in musical hints and the gift of gut-busting laughter. This show is Rated R. Only patrons age 21+ will be admitted.